The main reasons for insulating cold systems are condensation control and energy conservation. While conserving energy is an essential consideration, preventing condensation is becoming increasingly important, particularly in the indoor environment. Failure to adequately protect cold systems from moisture and/or condensation can result in substantial mold growth, which may significantly impact a building’s indoor air quality. This article focuses on controlling condensation to prevent mold growth on cold system insulation and other building components that may get wet from water dripping off “sweating” pipes. 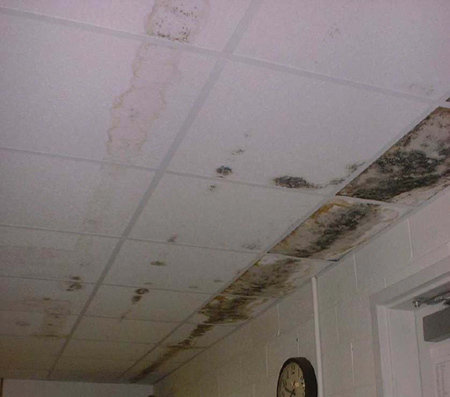 Molds have always grown in buildings; however, there are increasing numbers of reported health effects associated with exposure to continual or extensive mold growth in buildings. These reported problems are typically associated with extreme weather events (e.g., flood, hurricanes and tornados) or chronic water problems. In the past, most reported mold problems in buildings were associated with the heating, ventilation and air-conditioning (HVAC) system. Now, however, the industry is recognizing significant mold growth problems on many other building materials and components. It makes sense: Since most of the environmental conditions necessary to support mold growth already exist in many building materials, they come “seeded” with mold spores from natural infiltration. Plus, the temperature inside most buildings is generally within the optimal range for mold growth, and many building materials either serve as or are contaminated with appropriate nutritive sources for the fungi. Moisture is the limiting factor for mold growth within or on building materials; therefore, moisture control is the key element in minimizing the potential for mold growth. Insulated cold systems are subject to moisture from system leaks at valves, joints, etc. Perhaps more importantly, cold systems are also at risk from condensation on either interior or exterior surfaces. Condensation can impact large sections of the insulated cold system, compromising system performance and safety. From this author’s perspective, the primary safety concern is mold growth on the exterior surfaces of the insulated cold system. This is particularly true for systems in a building. Effective insulation of cold systems in the outdoor environment is critical for energy conservation and, to some degree, health and safety. Condensation from sweating pipes can create slip-and-fall hazards on wet or icy walking surfaces. However, mold growth associated with indoor systems presents a unique risk, as the fungal contaminants can degrade the indoor environment and expose the occupants to unhealthy conditions. The engineer or designer may be misled when designing the insulation for a cold system because of the assumption that environmental conditions within the building will be consistent and controlled. Unfortunately, buildings actually present multiple “local” zones that can change significantly over time, and it is these micro-environments where the risks of condensation and mold growth are the greatest. For example, many areas that house insulated cold systems—such as utility chases, mechanical rooms or plenum spaces—are subject to significant intrusion of outdoor air. This intrusion may be by design, as in a mechanical room that serves as a mixing box for the HVAC system, or by accident through breaches in the building envelope or stack-effect intrusion. In other situations, the cold systems may be housed in, or transitioned through, rooms that are directly exposed to outdoor air. Whatever the source, it challenges the effectiveness of the insulation system to deal with significant volumes of hot, humid air. Inadequate performance under these “stress” conditions is a primary cause of mold growth on these systems. Another concern when designing for an indoor system is the fact that the designer cannot control the operation of the building. Interior conditions may change significantly because of decisions to not operate the HVAC systems continuously, such as on weekends and extended holidays. These energy-saving decisions can significantly change the environment surrounding the insulated cold system as, again, the system may be exposed to a large volume of hot and humid outdoor air. In addition to the impact that condensation has on the insulated cold system itself, it also can wet other building components, raising the potential for mold growth there. Everyone has observed water-stained ceiling tiles or other evidence of water damage associated with condensation on cold pipes and HVAC components. This secondary impact represents a significant risk for the designer and installer of the system because poor performance of the cold insulation system has now affected the performance and safety of other materials. Mold growth associated with this “incidental” moisture can be quite extensive and lead to very costly remediation in the building. In the February 2004 issue of Insulation Outlook, John W. Kalis Jr., P.E. presented key issues to consider when determining the specifications for the main components of the insulated cold system. Key factors for specifying insulation include thermal resistance, operating temperature of the cold system, resistance to vapor/moisture entrapment, ease of fabrication with close tolerances for tight joints, compatibility with vapor retarder mastics and membranes, and resistance to mechanical and environmental abuse (such as vibration). An acceptable perm rating, ease in application, and resistance to abuse are important considerations when specifying the vapor retarder. The non-setting joint sealant should be specified on the basis of the exposed temperature of the sealant and its resilience (so it does not become brittle). Finally, the finish should be compatible with the environment and have a high emissivity rating on the outside surface, as well as the capacity to prevent failure of the vapor retarder, when specified. The key factor that affects the performance of an insulation system on a cold surface is insulation thickness. It is critical that the system designer specifies the correct thickness to prevent condensation. Under certain conditions, it may not be possible to prevent condensation 100 percent of the time—especially on systems that are exposed to outside air with extreme conditions that can exceed 90 F and 90-percent relative humidity for long periods of time, as can occur in a penthouse mechanical room on the coast. When extreme conditions are expected, the designer should calculate the insulation thickness that will prevent condensation a majority of the time—ideally, more than 90 percent of the time. Another option to prevent condensation is to take other precautions, such as enclosing the cold systems and conditioning the surrounding air so that dew point conditions never occur. It is also important for designers of insulated cold systems to know that the insulation thickness requirements in the energy codes of ASHRAE 90.1 and the International Energy Conservation Code do not necessarily prevent condensation. The thickness listed in these codes were set for considering the energy loss and what thickness would be appropriate from a cost/benefit standpoint—not to prevent condensation. It is therefore important to perform a calculation to determine the appropriate thickness for the design conditions. An excellent tool for calculating the correct thickness to prevent condensation is the 3E Plus® insulation thickness program. The program is free and can be easily downloaded from www.pipeinsulation.org. While all of these components are important to system performance, an appropriate, abuse-resistant vapor retarder is critical. Recognizing that ASTM Standard E96 assesses perm rating based on exposure to ambient temperature and 50-percent relative humidity (RH), care is advised when selecting the vapor retarder when outdoor air infiltration is anticipated or interior thermal/RH conditions may vary over time. The protective character of an abuse-resistant vapor retarder allows the designer to consider a broad range of insulation products for optimal performance under the specific design criteria. Having a low-permeance (< 0.05 has been suggested) and a durable vapor retarder that is properly installed can make an important difference. Maintenance is another important aspect in condensation management, in particular, careful monitoring and inspection to identify condensation or other water problems before they negatively impact building systems. Routine inspection of the cold system will permit the timely identification and resolution of performance failures, before they become significant liabilities. There are currently no state or federal regulations governing mold remediation. However, there are numerous non-regulatory guidelines that serve as a reference for potential mold and moisture remediators. These guidelines provide a hierarchal approach to remediation, which is based on the extent of water/mold-impacted materials. Most of the guidelines also focus on correcting the water problem, drying the building and building materials, and completely removing all mold growth and residual contamination. Specific recommendations regarding management of wet insulation materials vary within these documents and span options from simple drying to immediate removal. However, recognizing that the mold growth was the result of a performance failure of the insulated cold system, it seems intuitive that the impacted materials would need to be removed and replaced with a system design to prevent the conditions that led to the condensation and mold in the first place. Preventing water and mold problems should be easy. We know how to design/ specify insulation systems, select the appropriate products, manage the installation process, and effectively operate and maintain our buildings; however, we frequently fail to coordinate and integrate these processes. The result can be a wet building with mold problems. It is imperative that insulation manufactures, specifiers and installers collaborate to optimize the performance of their products. Education and communication are at the core of this collaboration. Manufactures must provide science-based information regarding the indications and limitations for their products—in particular, how the products perform in relation to other building materials and construction types. We must learn from experience to correct or control the factors that lead to mold growth associated with cold systems. These systems transition through variable environments, even within a building, and the design and specifications must account for the changing environmental exposures. The appropriate insulation system must be specified, and all of the components must be designed to work together, with particular focus on specifying the correct thickness of insulation to prevent condensation during worst-case conditions. A key factor in minimizing the impact of moisture problems is the availability of products that perform well within the design and construction constraints of the building. The insulation system must be compatible with the operating conditions and environmental exposures it will experience. Condensation from a cold insulated system leading to extensive mold growth. 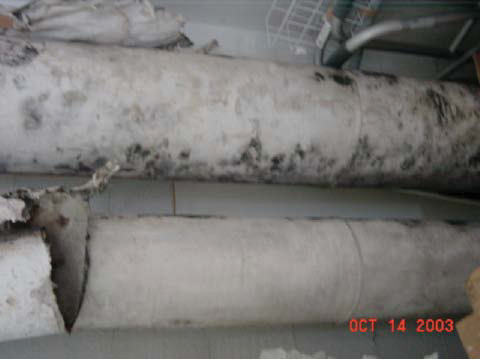 Mold growth on cold system piping in an unconditioned utility space.